In March, Portugal Made More Than Enough Renewable Energy To Power The Whole Country : The Two-Way The country produced renewable power equal to 103.6 percent of mainland Portugal's electrical demand — a feat "unmatched in the last 40 years," the Portuguese Renewable Energy Association says. 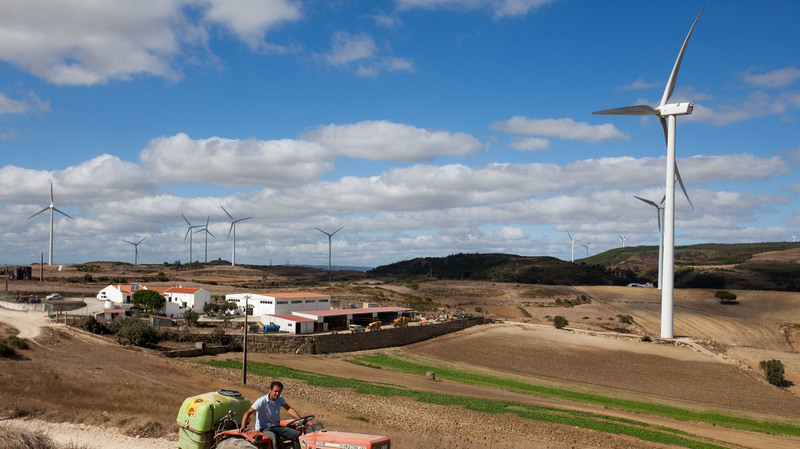 A wind farm in Sobral de Monte Agraco, Portugal, in August 2015. The windy hills north of Lisbon, once filled with grain windmills, are being increasingly populated with wind turbines. Last month, Portugal produced more than enough renewable energy to meet the country's entire electrical demand — a feat "unmatched in the last 40 years," according to the Portuguese Renewable Energy Association, or APREN, says. Fifty-five percent of that energy was produced through hydro power, while 42 percent came from wind. The country still used fossil fuels to balance out supply and demand. "There were some hours when thermal fossil power plants and/or imports were required to complement the electricity supply of Portugal," APREN writes. "These periods were nevertheless fully compensated by others of greater renewable production." And APREN expects that this pattern — of relying almost exclusively on renewable resources, with fossil fuels only as an occasional back-up — will grow more common. "It is expected that by 2040 the production of renewable electricity will be able to guarantee, in a cost-effective way, the total annual electricity consumption of Mainland Portugal," APREN writes. For most countries in the world, a fully renewable energy supply still seems like a challenging target. Some small island nations have managed it — and a few larger countries, too. Iceland and Norway meet essentially all of their electrical needs through hydro and geothermal power, and have for years — but those countries take advantage of extraordinary geology, making the accomplishment hard to replicate. Several small islands are all-green, but larger countries are rare. On particularly windy days in 2015 and 2017, Denmark exceeded its electrical needs through wind power alone. And several times in the past few years, Costa Rica has kept on the lights through on all-renewable power for several months, fueled by heavy rains that fed into hydroelectric facilities. Portugal also benefited from higher-than-usual rainfall last month, Reuters reports. As the renewable production rose, the price of electricity fell by about 10 percent compared to a year before, the wire service notes. "Portugal's electricity prices are among the highest in the European Union," Reuters writes. Portugal has made substantial investments in renewable energy sources, as has its neighbor Spain. Nearly a decade ago, Jerome Socolovsky reported for NPR from a wave farm project in the Portuguese town of Agucadoura — the first wave farm in the world, established by a Scottish firm. He explained that the project was set up in Portugal because of subsidies — namely, the feed-in tariff, "an artificially high price that the Portuguese government has set to encourage the generation of electricity by wave power." That wave farm closed soon after it opened. But public investment in renewables continued for years — as did the high electricity rates. Some of that spending was cut in 2012, amid austerity measures, and more were scaled back in 2016, Politico Europe reports. But by that point, many renewable energy projects had already been paid off and were operating cost-efficiently, Reuters reported in 2016. And this week, coincidentally, the Portuguese government put a stop to another energy subsidy — one "worth about 20 million euros a year, most of which goes to fossil fuel plants," Reuters writes.